Cbus Properties has received developmental approval from the Planning and Development Court of Queensland to continue its major apartment tower at 443 Queen Street after winning a court battle against the University of Queensland, which owns the heritage-listed Customs House, adjacent to the land which will feature the high rise. The Planning and Development court on Friday dismissed the appeal against the approval making a clear path for the tower to begin its ascent. The land is approximately 2183 sqm in area with about 65m of frontage to Queen Street. Immediately adjacent to the land at 427 Queen Street is Brisbane Customs House (“Customs House”), which is on the Queensland State Heritage Register and the Brisbane City Council Local Heritage Register. The high rise was described in the proposed development documents as “a high density, high rise, multi-unit residential building” which comprises two basement levels, a ground level lobby, 1330.9m2 of public open space, 355m2 of retail and restaurant/café spaces, six levels of elevated and landscaped car parking, a communal recreation terrace and a 40 storey residential tower comprising 264 residential units (“the proposed development”). It is also noted as part of the proposed development that new pedestrian connections between Queen Street and the Brisbane River will be provided. The delegate of the respondent who made the decision in the Decision Notice is Mr Leeds. He is a Team Manager and delegate in the respondent’s Development Assessment City West Team. He was the delegate responsible for assessing and subsequently approving the allocation of the TSA and the development application. "The question of whether or not the development application was indeed code assessable, to paraphrase French CJ in Public Service Association of South Australia Incorporated v Industrial Relations Commission of South Australia and Anor, 18 allows for only one correct answer, which is either yes or no. This constitutes a jurisdictional fact, and is not a matter of discretion. If the delegate answered the question incorrectly, he was acting in excess of his jurisdiction." "The applicant bears the onus of proving that the decision to approve the development application was infected by jurisdictional error. The evidence before me, including the evidence of Mr Leeds, is such that I cannot be satisfied that the Decision Notice is invalid and ought to be set aside. The development application was always code assessable. The change to it and the inclusion of the TSA took place in circumstances where there was a misapprehension as to whether this was the case. In any event the assessment of the application together with the application for the transfer of the TSA was conducted lawfully by a delegate operating within the extent of his jurisdiction to assess and determine such applications. 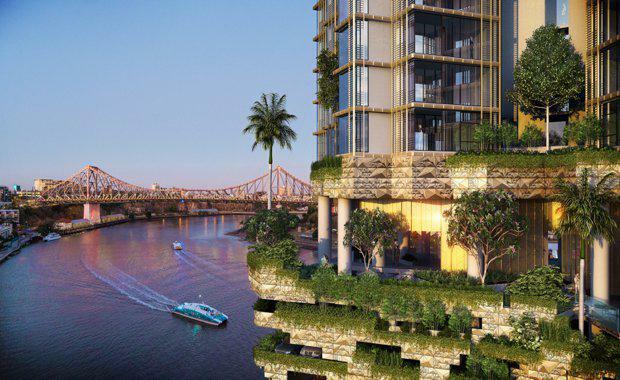 "Cbus Property, the property investment arm of industry superannuation fund Cbus, is also developing the $650m 1 William Street office tower and sees the Brisbane development as one of its flagship residential projects in Australia.